For the fashion selection some ankle boots and tights were added to the wishlist but I did go on a bit of a hunt for one of the corduroy skater skirts at Glassons. All the sizes I found were either too big for me or the wrong colours so when I finally found this black one it was a case of try on, fall in love and a bit of "walk away now and regret later" mentality. This will look gorgeous with aforementioned tights and boots in Winter I think. A statement necklace was on my list as my favourite diamante stud offering gets worn to death and this gold, slightly sparkly necklace was found at Dotti. The best part? It was half price. 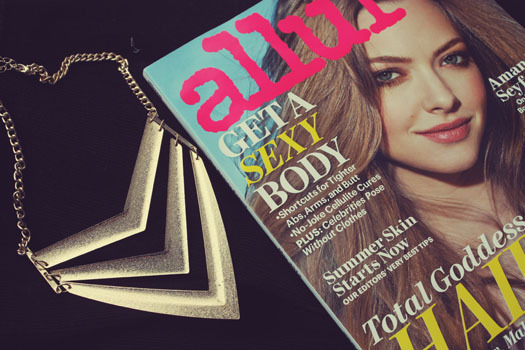 Reading material was taken care of with the May issue of Allure. The cover story with Amanda Seyfried is fantastic. Lighter bank balance, Macaron craving satisfied and nail needs all taken care of. Now to get the boot requirement sorted out.. I love this post S! I had so much fun shopping. Bring on the end of exams so we can go again. your nail polish and the necklace look so lovely! Thank you so much Lindsey! 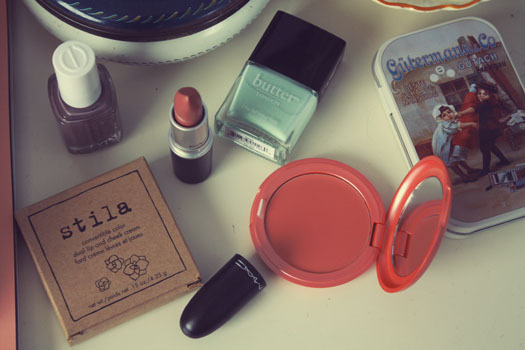 I am loving that butter London colour in particular, it's on my nails right now. Merino Cool looks beautiful! I love your blog!